Delicious and vet approved, your cat will love the taste of our adult cat chicken range! 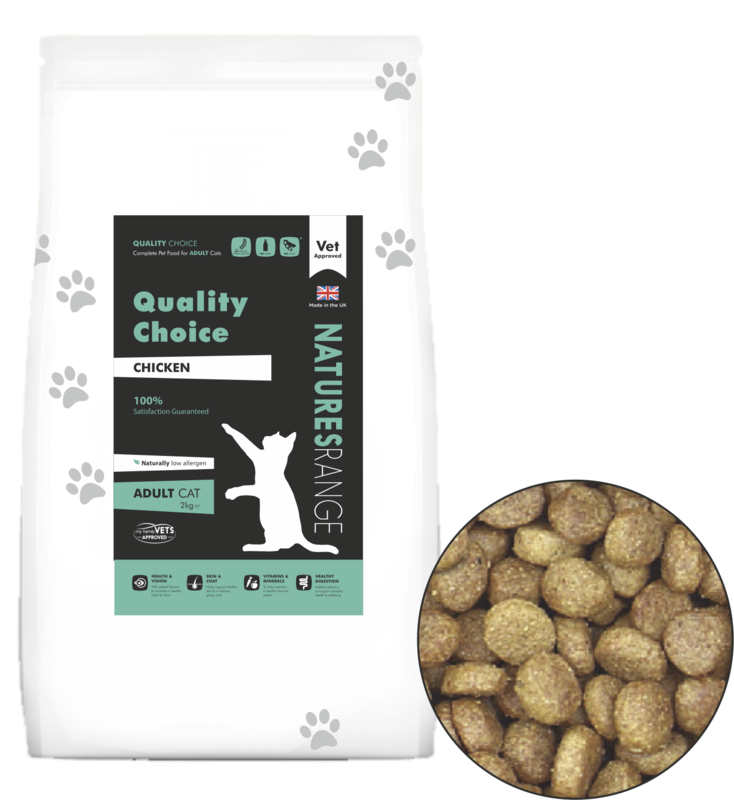 Our Quality Choice Chicken Diet for cats is approved by vets and is perfect for cats over 12 months old. Bag sizes available in 300g and 2kg. Crude Protein 30%, Crude Oils & Fats 18%, Crude Fibres 2%, Crude Ash 7.5%, Omega 30.78%. Poultry Meal (38%), Rice, Maize, Poultry Fat, Sugar Beet Pulp, Chicken Stock, Egg Powder, Fish Meal, Brewers Yeast, Salmon Oil, Minerals, Vitamins, Cellulose, Taurine, DL-Methionine, Mannanoligosaccharides MOS (318 mg/kg), Fructooligosaccharides FOS (318 mg/kg). Vitamins; Vitamin A (as retinyl acetate) 19,656 IU, Vitamin D3 (as cholecalciferol) 1,367 IU,mBiotin 260 mcg/kg; Trace Elements: Zinc Chelate of Amino Acids Hydrate 356 mg, Zinc Sulphate Monohydrate 296 mg (Total Zinc 160 mg, Ferrous Sulphate Monohydrate 321 mg, Ferrous Chelate of Amino Acids Hydrate 21 mg (Total Iron 99 mg), Manganous Sulphate Monohydrate 117 mg (Manganese 37 mg, Cupric Chelate of Amino Acids Hydrate 53 mg, Cupric Sulphate Pentahydrate 42 mg (Total Copper 16 mg), Calcium Iodate Anhydrous 1.64 mg (Iodine 1 mg), Sodium Selenite 0.53 mg (Selenium 0.24 mg); Amino Acids: Taurine 700 mg.